A Weekend with Yamaha Folch Endurance! I had just gotten back from Valencia WSBK on Monday afternoon, and no sooner had I taken a nap I got a message from my friend, Kenny Noyes, about some upcoming tests he had at Albacete, a racetrack in Southern Spain. Kenny had just competed as a replacement rider for David Checa (brother of Carlos) for GMT 94, a Yamaha World Supersport team. 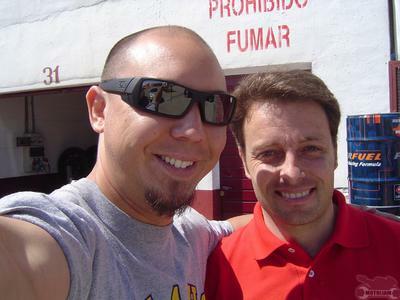 While he had a good time riding a 600 for the first time in years, it's not his main job, which is competing in the Spanish National Formula Extreme Champsionship (which is a series where the bikes are about halfway between an AMA Superbike and Superstock bike specification). Late Tuesday afternoon we piled into his Citroen van and prepared to drive to Reus to get ahold of one of his CEV (Spanish Championship) bikes. Away we went, and like all things, there were cool little details and problems that needed to be A) fixed, B) ignored, or C) just worked around. . . Here we are bombing down the freeway with the little five spd. engine maxed out, doing around 130KMH, but not really sure. . . . because the speedo cable had broken. I guess if you're used to racing bikes much faster than that and gauging speed by feel, then buzzing around in a slow van doesn't really register, haha. We arrived in Reus about an hour and a half later, thanks to the traffico de espanol, but arrive we did! Jose Maria Folch is a man who owns two Yamaha dealerships, and he has been racing Yamahas for 25 years straight! 25 years! He has seen a lot change in the world scene, and has competed in various levels of competition in that time, from local Spanish races to entire international series'. I was hoping I could learn a lot from watching his style and his operation, and I did! His race team headquarters is based at his home, a sprawling estate that isn't visible from the street. If Kenny didn't know which tiny dirt road to drive down, we never would have found it. Most of the team's budget goes to upgrading the bikes to the highest caliber possible, and they're transported in these rugged little vans all over Europe. 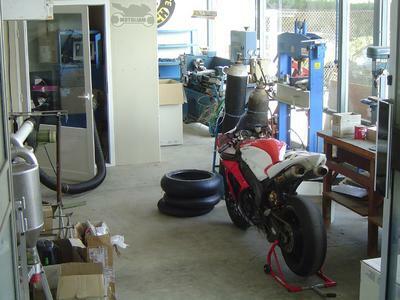 The raceshop is well sorted, with an area to work on the bikes, a separate room for engine/transmission work, another room for the machine shop, and more. There are wreaths and bottles of champagne throughout from previous victories, and there's a feeling of pride and history emanating from all corners. 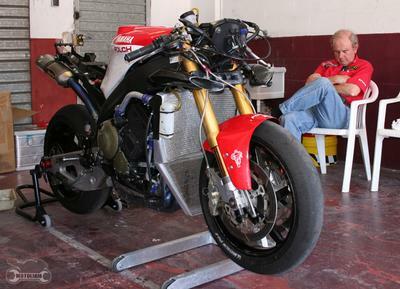 Here's an extremely rare R7 racebike. . . and it's been converted into an Endurance bike, to boot! I'd never seen on of these in person, and due to the limited production numbers (Yamaha only made enough to get the bike homologated for racing). Amazing! 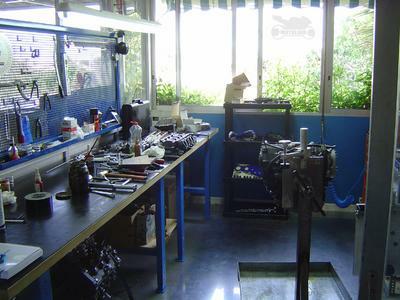 In the machineshop area, there are lathes, presses, valve grinders, and more. Some of the quick refuelers are stored here, and there was also an R1 resting here. . . with a 3000 dollar hand made aluminum fuel cel! Motor work is handled by a guy named Alex. He's been working with Folch for 16 years! He massages these engines to a nice state of tune, running well on 98 octane pump gas, and running *Really* well on Agip race fuel! Not to mention all the cool electronics and secret stuff that's installed on these machines. Good smells in the engine room, and I got really homesick thinking about all the engine work I've done myself in the past. We finally loaded up Kenny's van with the equipment we'd need for a couple days at the track, and we then cruised for about another five or six hours until we reached Albacete. Housing accomodations provided by the Van, which was split into two sections - the living quarters up front, the storage and changing area out back. It was sweet! Not only was a lot of it homemade by Kenny, like the electical hookups and beds, but Ikea provided some good storage options and containers. 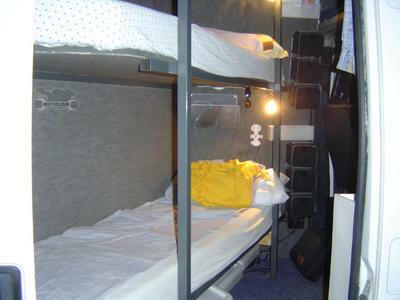 It was very professional, and if I was racing in the states, I would definitely like to roll in a van this well set up. 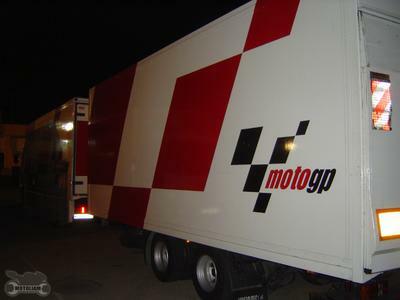 When we arrived, I immediately noticed the MotoGP academy vehicles. Apparently, they were here testing this week with their 125's, and because of this, I had the chance to speak with the crew from Monlau (the race mechanic institute in BCN). Monlau is expensive, but they turn out some decent wrenches. However, the more I work, the more I see that race mechanics and shop mechanics are two very different breeds, each with unique skills and abilities. I want to stress that - it is two completely different worlds. Because we were travelling light, I only had enough equipment to make this modest pit box. It was enough to do, because the real heavy work would come later. Kenny spun some laps around Albacete, and got re-aquainted with the circuit. Most people don't seem to remember this, but Albacete used to host WSBK rounds in the late nineties, and it's a nice track. Along with the Monlau crew (which is also sponsored by Repsol), I also met Emilio Alzamorra, former World Champion 125cc rider! 125 is a very demanding and unique class of racing, and anyone that can put it together to win a World Championship in this category possesses a ton of focus and dedication. Other notable GP racers in attendance were David Tomas, former 250GP rider. 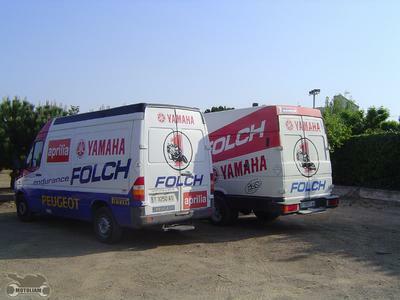 He was fast. . . .
After riding and prepping the Spanish Championship bike with Kenny on Wednesday and Thursday, the Folch Endurance team arrived. We had to switch garages and get ready, because we would be competing in a six hour endurance race on Sunday! Folch was running three teams, with three riders each. That meant a ton of tire changes for me. . . . but it was well worth it. Here's one of the bikes taking a nap, along with the boss! He's quite animated, and because the whole team communicates in Catalan (different than standard Spanish) it was a challenge for me to stay in the loop. I nodded a lot, played it by ear, and tried not to screw anything up. I think I did just fine, and who knows, maybe I'll work with them on some races in the future. Not only does Folch run in the Spanish Endurace races (the Copa de Resitencia), he also competes in the World Endurance races, and last year narrowly missed beating the full factory Castrol Suzuki team. If you compare budgets, you realize what an acheivement that is. . . 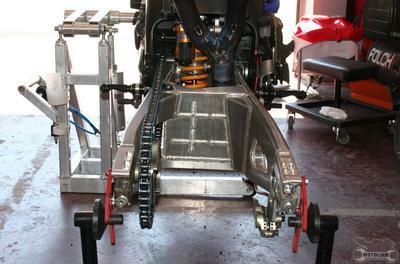 Here's a nice swingarm on one of the Endurance rigs. It features some fascinating quick change gear, like a sprocket that stays with the bike, and a brake caliper that has some trick parts in it. . . . all of it combining to make a full pit stop (meaning both tire changes, re-fueling 24 litres - 6 gallons, changing riders, and then some), only about 17 or 18 seconds. . . . and this is still a little off from the record of 13.5 seconds! 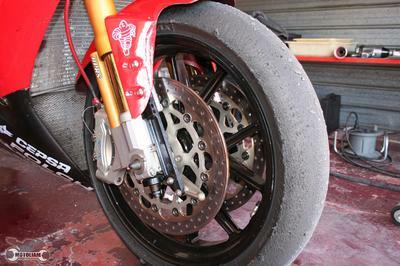 The brake pads have special magnets in them that keep the pads from falling in the way of the rotor when removing or installing the wheel, and the sprocket has a neat groove in it that locks the wheel into place in one quick move. Add a single axle that can be blasted in or out with an impact gun, and two guys can swap a wheel in just a couple seconds. Fantastic! Another shot of the cool swingarms used. They're much wider than stock, and use special wheels, too. After working with them for the last couple days, I decided that if I was ever putting together a special rig for the street, this would definitely be part of the package! 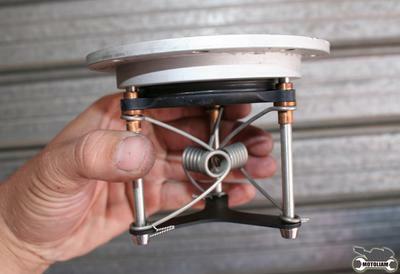 Here's a neat fuel cap, spring loaded, and one of two that are installed in the hand built Aluminum fuel cels. With these, there's no need to unscrew anything, just plug the fuel dispenser in, and a couple seconds later, remove, wipe, and get the hell out of pit lane and back into the race! Think Endurance racing is boring? It's not, though it can be quite grueling, both of the riders, and the crew! 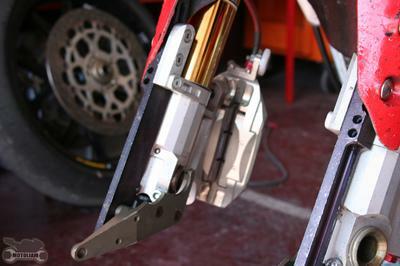 This is a shot of the quick change front fork, which is a remote gas charged Ohlins unit that was formerly on a Factory World Superbike last year. It has been modified to accept super brakes from Nissin, and I've never seen a front tire that was as simple or quick to swap out. Still blows me away thinking about it. If I make some custom street bikes for people (or myself!) this is another cool innovation that I want! Last shot for now. 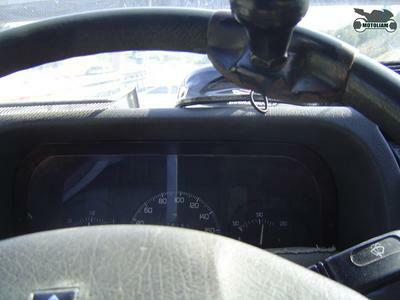 When the axle is blasted out, the wheel pops forward, the calipers spring out of the way, and the wheel is free. The new wheel is placed on the first notch, then the calipers are swung into place, and with a simple nudge, the wheel goes right into place - no lining anything up, just go!!!! 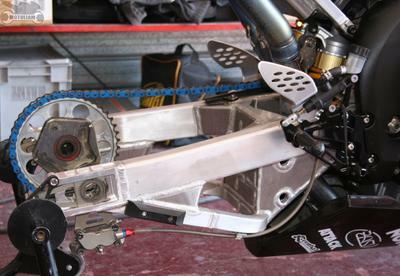 The axle is then re-installed (reverse threads so it doesn't loosen over time during the race) and it's zoom zoom zoom! The race itself was off the hook, and despite some technical issues during the six hours (one of the pilots had a nasty fall that bunged up a couple things) we managed to get the bike back to together and on track. . . all the way to second spot on the podium! It was amazing for me to be part of this, an active member of the pit crew, and a member of the team. I have a new and deeper respect for endurance racing, and while the lap times are not the absolute fastest, I doubt many fast riders could go out and ride until the tank was empty, then come in for fuel and tires, and go back out again. It happens, and it's incredible. You owe it to yourself to check out one of these races if you get a chance, and because the race is so long, there's plenty of time to move around, check out different aspects, and enjoy a day at the races! I'd add more, but I left my camera in Kenny's van last night when we got back into BCN at 1AM. Long week, and I'm bushed all over again. More cool stuff to come, as Liam continues on his wild adventures in the world of Motorcycle racing!